Home » Diabetes Awareness » Diabetes: What is it? How do the cells in our body get energy? Our body breaks down the carbohydrate component in our food into glucose. This glucose is sent through the blood stream to the various cells in the body to be burned for use as energy. It’s that simple. Only, not quite! Our body is a super complicated mechanism with lots of different types of cells, and lots of different processes happening in different parts of the body. And so our body has a system of signals to send messages to the cells about what they should do. In a normally working body insulin, a hormone secreted by the pancreas, is sent through the blood stream to signal to the cells to take up the glucose in the blood stream for use as energy. In a diabetic person either the pancreas is unable to produce any insulin at all, or is unable to produce adequate amounts of insulin, or the cells are unresponsive to the available insulin. As a result of this lack of insulin or lack of responsiveness to insulin the cells are unable to absorb the glucose in the blood stream and burn it for energy. Since the cells are unable to absorb the glucose, the level of glucose in the blood remains very high. And that is diabetes. 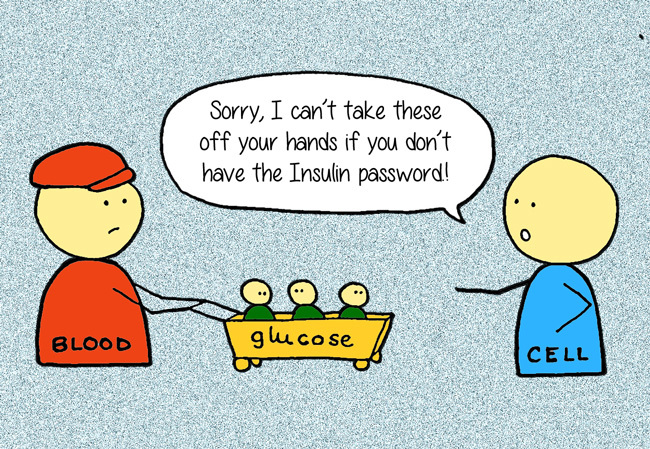 When insulin is no longer produced in the pancreas, it is Type 1 Diabetes. When the cells are unresponsive to insulin or the pancreas is unable to produce enough insulin to be effective, it is Type 2 Diabetes. When a mother’s cells are unresponsive to insulin during pregnancy, it is Gestational Diabetes. This means diabetes cannot be cured, only controlled through diet, lifestyle and medication that may include insulin injections. High blood glucose levels can lead to several health complications including blindness, heart problems, kidney disease, and amputations. The goal for diabetes management is maintaining blood glucose levels within the acceptable range through diet, lifestyle, and medication and therefore to delay or avoid any complications. Interested in facts and figures relating to global diabetes? Check out this link. Read more about the Types of Diabetes here. Very well explained, Priya! I have passed on your website to my team (I head a technical writing firm) as an example of clear, concise, precise writing! Fantastic work Priya,.. So simply explained and yet effective.